Despite the economic and social benefits brought by tourism, however, many countries have been experiencing the consequences of the increased number of tourists and excessive development, including coastal degradation, the loss of biodiversity, higher risks of climate change, etc. In particular, the Eleventh Meeting of the World Committee on Tourism Ethics has closed with calls to make “Safe Coastal Tourism” a priority in coastal destinations worldwide. The need for well-designed plans for sustainable tourism is highlighted to ensure the long-term economic, environmental and social benefits, especially for coastal regions. These areas need to sustain its own characteristics in order to achieve balanced local development in the long term. In this context, tourism has become internationally and officially recognized within the UN dialogue such as the UN Commission on sustainable Development (1999) for the question of ‘quality tourism’ rather than its ‘quantifiable volume’. The dominant agenda on tourism development has moved its focus from ‘how much developed’ to ‘how well developed’, which called for the need of sustainable tourism management. 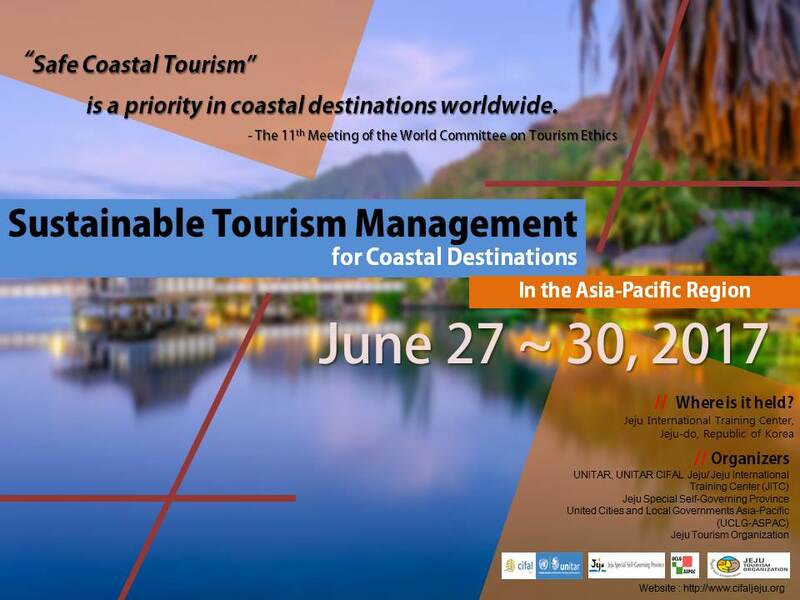 This workshop, therefore, provides a venue for participants to understand the sustainable tourism management for coastal destinations through various lectures and group activities. Best practices on sustainable tourism will be presented, offering opportunities to explore well-designed tourism development cases around the world. There will be sessions to discuss good policies and practical sustainable tourism projects in line with the UN SDGs. Finally, the workshop will help local actors effectively develop relevant policies, promoting and enhancing their geographical advantages for the social, environmental and economic benefits in the long term. · Provide an opportunity for the local governments and cities in the Asia-Pacific region to exchange sustainable tourism policies and best practices through city-to-city cooperation. · Offer a venue for knowledge sharing and discussion and motivate participants to implement sustainable tourism policies, with particular focues on coastal management. · Have a basic understanding of sustainable tourism and deepen the ideas of sustainable practices for regional/city/local development through local people’s participation. · Understand the economic impacts of sustainable tourism on the regional development, recognizing the importance of environmental and cultural conservation for sustainable tourism. · Coordinate partnerships to effectively promote the benefits of sustainable tourism policies with civil societies, government and local entrepreneurs.